The 7th Osaka Go Camp has been announced for June 23 – July 11 . Ryo Maeda 6p, long a favorite at the annual U.S. Go Congress, is once again the host and chief organizer. 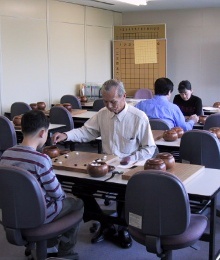 The camp includes league games in the mornings and teaching programs — in English — with professionals in the afternoons. On days off, there are organized day trips to places like downtown Osaka, Kyoto, Nara, as well as a two-day trip to Ise and Iga. There will also be a friendship tournament with the Ise Go club, and sightseeing includes Ise grand shrine and Ninja museum. A few events will be held at the Kansai-Kiin, where most of the camp’s professionals — including Maeda — are from.